To make your phone react with different ringtones to internal and external the PBX can send an Alert-Info header in the SIP signalling to your phone device so that the device knows which ringtone to use for the call. 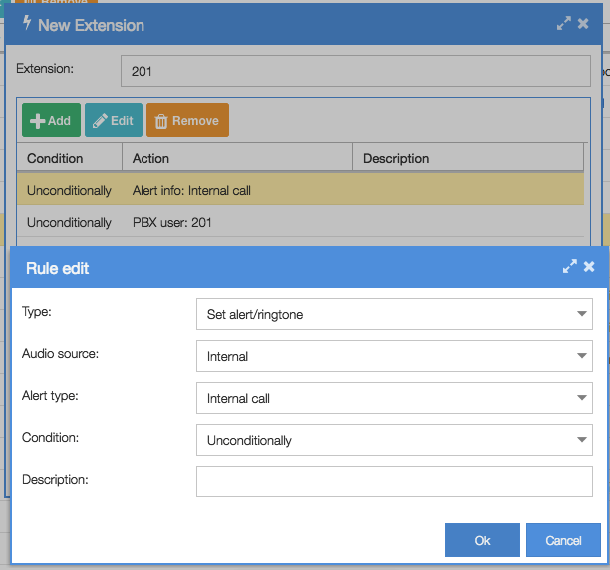 Instead (or in addition to, but not obligatory) you can also add a rule ‘set alert/ringtone’ to your DID’s in the main dial plan, in which case you would of course chose ‘alert type: external’. If you used zero-touch autoprovisioning for your phone devices you are now already done, as we added a bit of configuration to the template files by default. If you wish to use another ringtone than is set by default you will need to pick a different ringtone. E.g. if you’re using a Yealink device (and assuming you’re using the zero-touch autoprovisioning) you can add the following snippet to the Extra Config tab of your phone in Communication/Phones (to set this for one device only), or to the Extra Config tab in Communication/Phones Global Settings tab (the latter requires you to chose a phone type before pasting these configuration settings) if you wish to set this for all your devices. 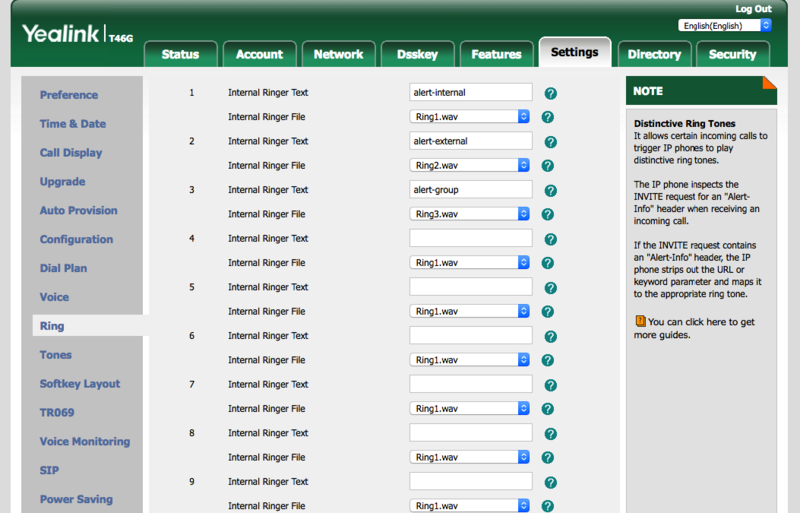 Ringtone (ringer) #6 is one that quite clearly differs from the others in Yealink devices. Changes will take effect only after your device has pulled the configuration again, which can take up to 24 hours. You can speed up this process by restarting your phone device. Here you should set an internal ringer text (alert-internal or alert-external) and choose a ringtone.